There were a lot of experiences– both amazing and not-so-amazing– at my first Metatopia last weekend, where I brought Threadbare to playtest among strangers and other professionals. Totally not intimidating, right? I went with my friend Toby, and we practiced the buddy system quite a bit all weekend. This meant I was less likely to go insert myself into groups the way I normally do, but also meant that we always had someone watching out for each other, making sure we ate and hydrated, and going to bed at reasonable(ish) hours. Also, having someone split a bar tab with you is always nice. There was a meet-and-greet with other female and non-binary designers on Thursday night, which was fun and exciting and involved a lot of arts and crafts. I was exhausted, having been up since about 2:30 that morning and having spent 3 more hours than I was capable of spending at the Newark airport before we finally caught a ride and got into the hotel. Nonetheless, not having any overly structured things on Thursday really helped us settle in. My playtests were pretty good. I playtested Threadbare twice over the course of the weekend. The first test was Friday afternoon, and it went…. okayish. I’ll get to that in a minute. The second test was a “hi level” test on Saturday. Here’s where I had a group of playtesters who are also designers and experienced in the industry. All four of my playtesters were magnificent– Rob Donoghue from Evil Hat, Mark Richardson (of the recent Headspace Kickstarter– back it while you can! ), Dewitt Davis, and Kate Beaman-Martinez. Each one embraced the intent of my game– to play broken toys overcoming obstacles and building stuff using a combat-light approach. We even reached a logical end to the story, which was fantastic. And the playtesters helped me, at the end of the session, to figure out why the game I had written does not support the game I want it to be. Oh, it was so wonderful to finally understand, really understand, what’s going on and see ways to fix it! “That guy” did not want to play a PbtA game at all, and resented that he was in my playtest from the very beginning of the session, and complained that it wasn’t in the program book as PbtA. I don’t know why I didn’t ask him to leave right then. “That guy” talked over others. Negated what they were doing (because his character sheet implied he could do it more efficiently). Wanted to kill things. Killed things. Was, basically, a bully not just in character, but out of it. And the worst part is: I don’t think he had any fun, either. I didn’t push back nearly as hard as I should have against this, in part because nothing he was doing was much worse than what I’ve seen at every game table ever. Seriously. It’s rare to have a table like my hi-level playtest. More often, it contains one or more variations on Mr. Aggro Microaggression. When doing my post-mortem in the hotel room later, I asked Toby if “that guy” had talked over the other straight-seeming man as much as he had over the rest of the group. He confirmed that, no– the straight-seeming guy was less subject to “that guy’s” behaviors (which is interesting, because the straight-seeming guy would also be less sensitive to them). I sighed with disappointment. I pride myself on defending my table, but in truth– I failed my players, for which I am sorry. I have reasons for this, but not excuses– this was my table, and I should have shut this down decisively. I know nobody’s going to blame me, but I always take note when I’ve run a game in a manner that is below my own standards so I can improve next time. I did get some valuable feedback and experience from that playtest, however. I quickly saw that if someone wants combat, my game does not put enough obstacles in the way to make it less possible or desirable. My game doesn’t disincentivize combat, and as one playtester pointed out, as written it kind of puts it front and center. 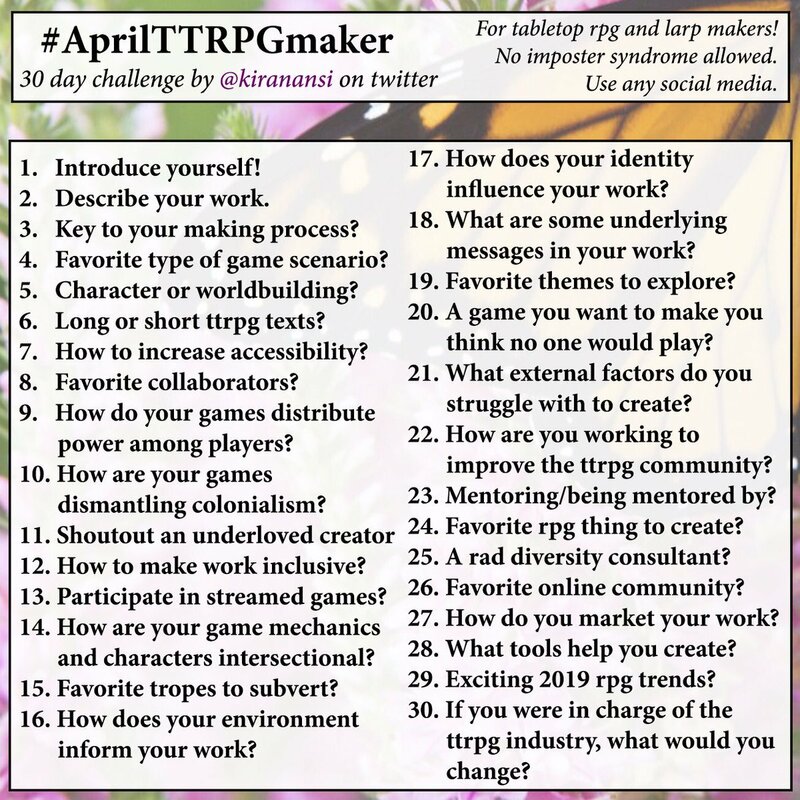 As playtesters in both that game and the hi-level game pointed out: I have a lot of moves and space dedicated to how to engage in combat, which makes it the thing people are interested in doing. I saw that the game didn’t reward cooperation enough, though it would take the hi-level test to really show me how that could be done better. Many of the problems I had were my own fault– poor table management damages any game, but especially playtests. I can’t get a useful playtest when someone at the table resists the game. If you don’t want to go on an adventure– if you don’t want to go on this adventure– then stay home, and stay out of my playtest. I’m here to work on figuring out how to get my game to play the way I want it to play, not cater to your microaggressive temper tantrum. Also on Friday, I playtested Toby’s game, Family Band, which had similar issues with players offering not-quite-helpful advice and feedback. I’m really hoping that, with three playtests, he was able to cobble together enough useful feedback to be able to get his game where he wants it. It’s a really good game, and although I know I totally pimped for him all weekend, it’s because he’s done some really innovative things with it. It’s basically Scooby Doo in an RPG, and really, really fun. I also playtested a board game that sounded interesting. It was, but I think it plays a little too slowly. I took to timing each turn to let the designer know how long, roughly, a full game would take if played out to conclusion. 2-3 hours is a little too long to stay engaged with something that has a random element and only shallow strategic decisions to be made. Friday night had me on a panel for the Threeforged contest, which I participated in (I’ll eventually link to my games). It was a good little round-table discussion about how the process went, what responsibilities we felt towards our co-creators, and whether anonymity helped or hindered our processes. On Saturday, I playtested Beth Rimmel’s Crazy 8s, which was an interesting game. I think she might need to rewrite the tin a bit to change expectations of what the game will be, but she has a clever way of going about character creation in a semi-crunchy system. I also played in Sarah Richardson’s hi-level session of Bluebeard’s Bride. Which will eventually give me nightmares, but in the meantime… wow! That was the kind of game session that demanded trust (which was well placed, with Sarah Perry-Shipp, Megan Knouff, Fred Hicks, and Jason Morningstar at the table), and which used “I will not abandon you” content rules. That style of gaming is “let us trust each other to tread in waters that are unsafe. Trust each other to say when we are in too deep and need to pull back. Trust each other not to leave each other in those waters to drown.” But oh, my, it is dangerous water indeed! Sarah continues to be an absolutely terrifying GM for horror games. Just before dinner on Saturday we did the Game Jam, which was awesome. Toby had had a rough ending to his hi level playtest and we both just really needed something silly. Rowan Cota ran an excellent jam, in which our team included Bryan Soriano from Wandering Tribe Games and Chris Perrin from the This Just In podcast. We created an incredibly silly party game called Amazing Stick, in which you perform silly acts to be awarded an Amazing Stick. There was very little win/lose in the actual actions– just doing them deserved rewards. If I were analyzing this game, I’d call it an improv exercise more than anything else. Nonetheless, it was exactly what we needed. Saturday night I was on a panel with Avonelle Wing about the Double Exposure Envoy program. If you aren’t in this and you like to demo games and get free games, you should totally sign up. We’re going cool things with RPGs, in addition to all the wonderful stuff they do for board and card games. Saturday after the panel, Toby was tired after running his game twice already, but also interested in running his game with a group that would not include any “that guys.” And, also, he wanted to run it for the This Just In podcasters, since they were so interested. So I rounded up Mario (from This Just In), Whitney Delaglio, and Barbara Ng for a spontaneous session of his game. We started after 10, had beer and other drinks, and left the “test” part off of the playtest and mostly just played for fun. It was hilarious and fun and epic and Whitney laughed so hard, I was afraid she might need medical attention. On Sunday, we recorded with This Just In, and look forward to when our interviews go live on the site! We finished up with me doing another panel, and then it was off to the airport. Just before we left, I stopped by the Modern Myths booth to pick up any Threadbare ashcans (and found out they’d sold one!) to bring home. The ashcan was a 16-page spiral-bound booklet I had made at FedEx Office the day before we left on our trip. I made them to hand out to playtesters, publishers, press, and whomever else I wanted to read it. I’m glad I did, but I now have about 10 left to figure out homes for. Since the rules are now going to change a lot, these will be worthless in about a month. A common theme Toby and I encountered at #Metatopia: You should use ______ for your system instead of _________. Since we designed our games as Powered by the Apocalypse games, that meant “you should use Fate instead of Apocalypse World” was common, but we also had recommendations for home-made systems that the person playtesting had made, Fiasco, GURPS (seriously), and a few other games. 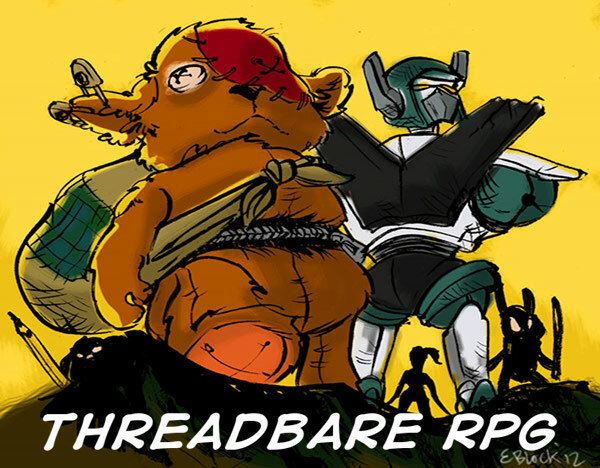 I’m pretty sure I only barely dodged someone suggesting I use Shadowrun for Threadbare. “It’s a stretch goal” is an awesome response because it’s vague about *when*. For instance: I will set the Gurps version of Threadbare at a lofty stretch goal of $1,000,000. If we raise that much for my little game, it totally deserves to be adapted to Gurps, I swear. In conclusion, my thoughts on Threadbare and Metatopia are that it was a wonderful experience. I’m really glad to be moving forward with this game, which has been stuck for almost 4 years now. I’m endlessly grateful to my playtesters– yes, even the ones I didn’t find helpful. Special shout-outs to Paul Stefko and Alex Trepanier, who gave a lot of great advice this weekend. It was wonderful talking with both of you about games and design. Special super-duper shout-outs to Elsa Henry, Avonelle Wing, and Vinny Salzillo, who made the convention a wonderful and safe place to make games!